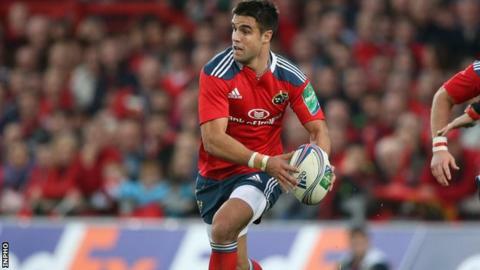 Ireland scrum-half Conor Murray has agreed a new two-year contract with the Irish Rugby Football Union that ties him to Munster until June 2016. The 24-year-old is believed to have rejected approaches from French Top 14 clubs to remain at home in a deal funded by the IRFU. Murray made two Test appearances for the British and Irish Lions in the summer and has 22 Ireland caps. "I'm thrilled to sign a new IRFU contract," said the Munster scrum-half. "In 2013 I learned a lot as a player with my club, Ireland and the Lions and I hope to continue to develop and push for honours over the coming years." Murray made his senior debut for Munster against Connacht in 2010 after graduating from the academy and has since made 49 appearances for the province. "Conor has illustrated in recent months the value he brings not only to Munster, but also to the national team," added Munster coach Rob Penney. "At 24 he is still a young guy and he has the potential to go on to become one of the best scrum-halves in the game." Murray's decision to continue to play his club rugby in Ireland is a boost for the IRFU after his international half-back partner Jonathan Sexton's move to Racing Metro earlier this year. The scrum-half looks to be in danger of missing Munster's Heineken Cup clash against Perpignan in France on Saturday after sustaining suspected knee ligament damage in Sunday's win over the French outfit.